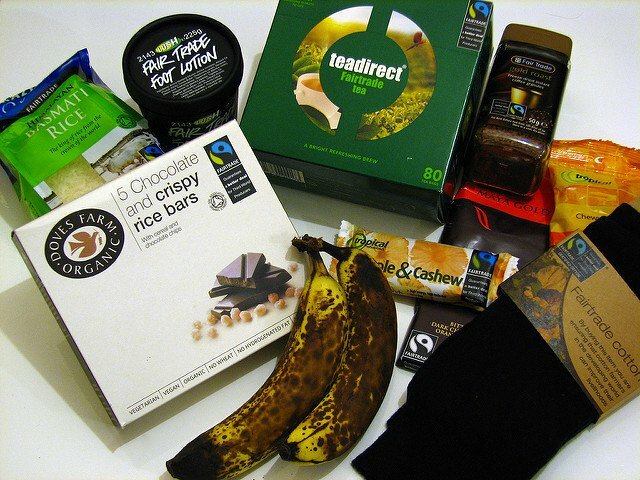 As Fairtrade Fortnight commences it is important to demystify the economic arguments surrounding fair trade. Is it the case that promoting social justice in the supply chain can serve to undermine the long term prospects of poor southern producers? One of the most persistent critiques of fair trade is that artificially pushing prices upwards incentivises producer activities which are not beneficial to long-term economic development. Prices are manipulated through either the agreement of above market minimums as required by Fairtrade International certification or efforts to pay more by dedicated fair trade intermediaries who are often members of the World Fair Trade Organisation. The problem is compounded because fair trade works mostly with agricultural commodities; the 'real' value of which is declining vis-à-vis the more highly processed exports of wealthier countries (See Graphs 1 and 2). Therefore, extending agricultural production must be considered as only accentuating the problems of long-term secular decline in the 'terms of trade' between wealthy and less economically developed countries. On this basis, it is argued that southern economies must diversify out of lower and into higher value economic exports; and instead of encouraging continued agricultural production, those in the north should preoccupy themselves with facilitating this change. The message is clear: we should stop buying fair trade goods because the retraction of the medicine in the short term will be better for the patient in the long term. Flickr/flickrich. Fair trade products. Some rights reserved. Despite the seeming logic of this position, especially to those with a rudimentary knowledge of the forces of supply and demand, the argument can be strongly questioned from both a theoretical and empirical perspective. To begin with, 'The Economist’s Critique' of fair trade (as the rhetoric has it), presents a false choice: producers cannot realistically switch overnight from growing coffee to producing cars or providing international accounting services, and the same goes for the wider economy. Instead, transition has to be incremental at all levels, as before long-term strategic investments can be made it is necessary to accumulate sufficient resources to execute them. This means that where current productive activities have been strongly conditioned by historical precedent to focus on agricultural activities, it becomes necessary in the short term to increase returns from these in order to generate the additional resources needed for more fundamental economic changes. Fortunately, current knowledge identifies that irrespective of the level of analysis, three broad options are available: 1) improving quality and efficiency (e.g. producing better quality oranges for less), 2) processing raw goods at source (e.g. making apples into juice), and, 3) shifting to higher-value agriculture goods (e.g. shifting from growing bananas to avocadoes). However, it is still necessary to stimulate diversification into higher income sectors within agriculture and it is on this question that pro- and anti-fair traders fundamentally disagree. Critics argue that upward price manipulation will incentivise producers to remain in low-value sectors. However, Fair Trade organisations recognise that prices are not set simply by the ratio of producers to end consumers – and so prices are not an irrefutable naturally occurring fact. Instead, international and local buyers use ‘oligopolistic’ markets (where there are many sellers and few buyers) to drive down prices for their own advantage (and for the members of northern consumer societies in general). While existing price structures are politically manipulated, these ‘incentives’ are clearly not the only factor in decisions about the diversification of production – and there are three well established microeconomic realities that explain this. Firstly, while low earnings and poverty is clearly a ‘push’ incentive to leave low-value sectors, it cannot be assumed that there are ‘pull’ factors towards other livelihoods. While we know prices for avocadoes in European supermarkets are higher than coffee for example, this will not be known by producers. Even if it was, there is no guarantee that they have an opening to export avocadoes as commercialisation channels tend to be strongly historically conditioned – or at least the necessary initial inputs do, that enable such a transition to be made. Secondly, even if the international pricing system was transparent and could be interpreted by producers, farmers require resources to respond. In the example of moving from the production of raw coffee beans to roasting the final product, farmers will need both financial capital and knowledge. Unfortunately however, the very definition of poor producers means that they will not have such resources to hand – and it is unlikely that they can get a bank loan and the necessary training at the local agricultural college, as these services are part of the condition of working within an area of low economic capability. Thirdly, even where farmers can access the resources necessary to respond to price incentives, they will factor in the ‘risks’ associated with the investment. The price for any product is only realised when it can be sold. In the developing world new investments are incredibly risky given the myriad of natural (landslides and droughts) and human (political and economic volatility) disasters which bring great probability of failure. Also, producers will rightly not assume that they will be effective in new livelihoods, and there will be a time lag between diversification into a new product and economic remuneration for its sale. For these reasons, plus the fact that the cost of failure is so high for those in poverty (as captured by the theory of declining marginal utility), developing world producers are renowned for being conservative in their investment decisions as they accept lower remuneration for greater stability. Indeed, much of the diversification that takes places everyday by highly entrepreneurial actors in developing countries is primarily concerned with risk reduction and not capital accumulation. Flickr/angela7dreams. 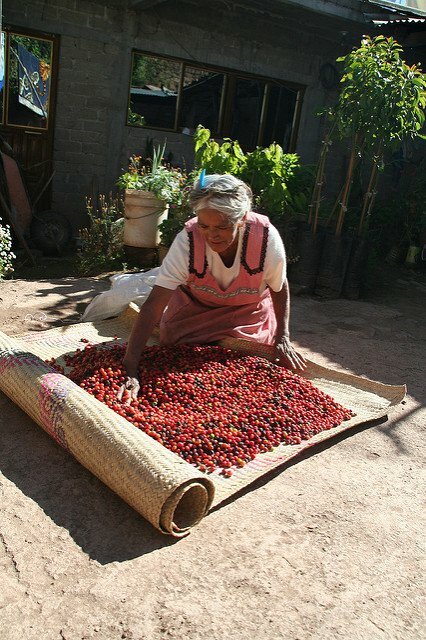 Harvesting coffee beans in Oaxaca, Mexico. Some rights reserved. For the above reasons it is clearly inappropriate to assume that developing world producers will simply respond to price incentives and diversify – and instead, it is essential that support mechanisms are developed to facilitate the process of value adding diversification at all spatial levels. One example of this has been Fair Trade, which was established to help producers deal with the real life limitations on livelihood development by manipulating prices upwards as well as offering long-term trading relations to provide the necessary stability for long-term planning and eventual diversification into higher-value products and processes. This stable income can also act as collateral for raising loans to carry out business development that would otherwise not be possible for marginalised producers. Furthermore, the payment of a social premium under some fair trade approaches allows for the development of wider human capital in the areas of health and education. While this could theoretically be achieved through simple aid transfer, such an arrangement would not allow economic actors to ‘learn by doing’ in terms of what it takes to be self-sufficient in an internationalised economy. Beyond this theoretical discussion, not only does empirical evidence demonstrate that Fair Trade certified producers have increased the quality and hence the price of their products, but also that they have diversified away from growing basic ingredients into producing more highly processed exports. In the Windward Islands, producers have diversified into other crops and are now developing a very high value tourism sector; in Africa producers of cocoa have moved into artisan soap production; and in Mexico, Fair Trade cooperatives have diversified from coffee into marketing of cocoa, honey and organic preserves, and even set up a clothes factory. While these changes might look small they are staggering concrete steps for building local economies and helping the transition towards the export of more highly processed and manufactured goods. Indeed, many of these successful examples are testimony to ‘gold standard’ fair trade organisations (such as Divine Chocolate, Café Direct and Just Trading Scotland), often members of the World Fair Trade Organisation, that go above and beyond requirements of Fairtrade certification, proactively tutoring producers in improving business practices and leveraging support for investment in production capacity. In some cases, they also work hard to build wider development capacity. The work of Twin Trading and Imani Development to invest in the Ari-nut food processing facilities in Malawi is an outstanding example of what can be achieved. In conclusion, Fair Trade will not necessarily have the reach to catalyse universal transitions to the benefits of an increasingly integrated global economy. But what is possible is that where best practices are followed, such governance can help poor producers overcome the obstacles to investments in value-adding diversification and provide the stability needed for long-term planning. However, for this potential to be maximised, organisations involved in the fair trade movement must resist using the concept and its discourse as a marketing tool for commercial gain. Weaker operations should work harder to prioritise the needs of producer development and those responsible for setting the standards that embody the values of the movement must remain strong in the face of pressures for commercial co-option. Smith, Alastair M. (2011). Fair trade Governance, Public Procurement and Sustainable Development: A case study of Malawian rice in Scotland. PhD Thesis, Cardiff University. Smith, Alastair M. (2009), Fair Trade, Diversification and Structural Change: Towards a broader theoretical framework of analysis Oxford Development Studies 37(4).